Doodlecraft: Pixel Hama Bead 8-Bit Bows! Pixel Hama Bead 8-Bit Bows! 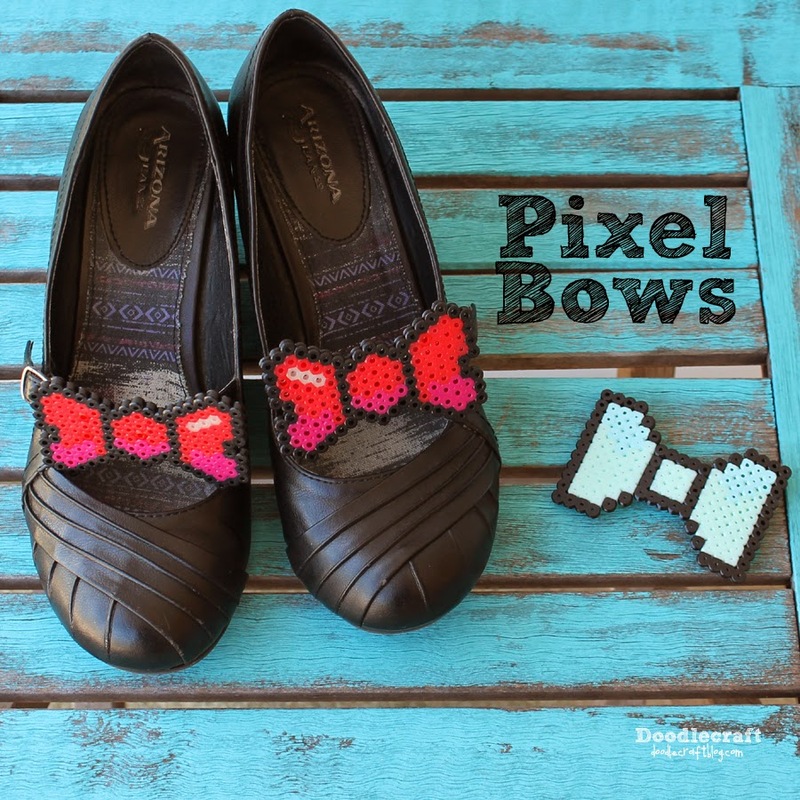 Make adorable pixelated bow shoe clips! After all, Bowties are, and forever will be, Cool! Or a fabulous geeky chic hair clip! Using Perler, melty or hama beads! We absolutely love perler beads. But we've ended up with a jumble of mixed colors in big bags. And not a black one to be found! searching take half the time of the making process! But...I got some packages of specific colored beads sent to me from Wholeport! Now I have some metallics, mint, skin tones and black! About $2.59 per package of 500...great for getting the specific colors you need! They have about 60 different colors. Here's how I do a pattern. For this one I used the hexagon shaped board. Just trace the board on some scrap paper...like this. Draw the basic shape you want. Place it back on top and follow those guidelines. but having an outline is very helpful! Outline the bow in black. This will give it the true 8-bit feel. I did an ombre bow...with a little highlight! Place parchment paper over the top and iron gently. Carefully turn the entire thing over, cover with parchment and iron the other side. The edges of the perler beads will melt and stick together. Repeat for a perfect pair of bows! For the hair clip I used the square peg board. Filled in the same with a varying color scheme for depth! Now I did 2 with shoe clips and the other a hair clip. Instead I used a french clip. I wrapped it with thread to keep it's shape while the glue dried. I used the same glue for the shoe clips. Clipped on the buckle strap of these mary-janes for the perfect accessory! Great geeky accessory for cheap!